A process is a program in execution. For example, when we write a program in C or C++ and compile it, the compiler creates binary code. The original code and binary code are both programs. When we actually run the binary code, it becomes a process. A process is an ‘active’ entity, as opposed to a program, which is considered to be a ‘passive’ entity. A single program can create many processes when run multiple times; for example, when we open a .exe or binary file multiple times, multiple instances begin (multiple processes are created). What does a process look like in memory? Text Section:A Process, sometimes known as the Text Section, also includes the current activity represented by the value of the Program Counter. 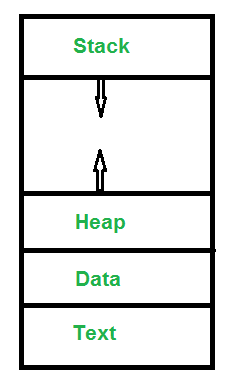 Stack: The Stack contains the temporary data, such as function parameters, returns addresses, and local variables. Data Section: Contains the global variable. Heap Section: Dynamically allocated memory to process during its run time. Refer this for more details on sections. A process has following attributes. 2. 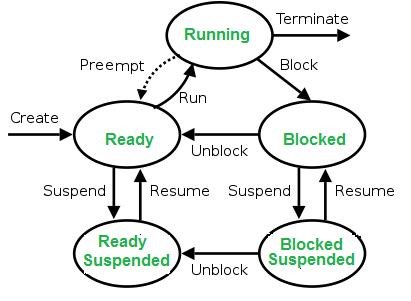 Process State: Can be ready, running, etc. All of the above attributes of a process are also known as thecontext of the process. Every process has its own program control block(PCB), i.e each process will have a unique PCB. All of the above attributes are part of the PCB. 1. New: Newly Created Process (or) being-created process. process is ready for execution. a time can be under execution in a single processor). 4. Wait (or Block): When a process requests I/O access. 5. Complete (or Terminated): The process completed its execution. 7. Suspended Block: When waiting queue becomes full. The process of saving the context of one process and loading the context of another process is known as Context Switching. In simple terms, it is like loading and unloading the process from running state to ready state. When does context switching happen? 4. Preemptive CPU scheduling used. A mode switch occurs when CPU privilege level is changed, for example when a system call is made or a fault occurs. The kernel works in more a privileged mode than a standard user task. If a user process wants to access things which are only accessible to the kernel, a mode switch must occur. The currently executing process need not be changed during a mode switch. A mode switch typically occurs for a process context switch to occur. Only the kernel can cause a context switch. A CPU-bound process requires more CPU time or spends more time in the running state. An I/O-bound process requires more I/O time and less CPU time. An I/O-bound process spends more time in the waiting state. In a process context switch, the state of the first process must be saved somehow, so that when the scheduler gets back to the execution of the first process, it can restore this state and continue. The state of the process includes all the registers that the process may be using, especially the program counter, plus any other operating system-specific data that may be necessary. A translation look-aside buffer (TLB) is a CPU cache that memory management hardware uses to improve virtual address translation speed. A TLB has a fixed number of slots that contain page table entries, which map virtual addresses to physical addresses. On a context switch, some TLB entries can become invalid, since the virtual-to-physical mapping is different. The simplest strategy to deal with this is to completely flush the TLB. (D) nothing can be said about the relation between t1 and t2. Explanation: Process switching involves mode switch. Context switching can occur only in kernel mode.